All schools successful in the first round of the fund were rated as Outstanding, with 98% of grammar schools rated either Good or Outstanding overall. Grammar schools are also popular with parents, with around 15 pupils choosing a selective school as their first preference for every 10 selective places offered. Today’s announcement builds on the 825,000 new school places created since 2010 and the one million this Government is on course to create by 2020. "Selective schools are some of the highest performing schools in the country and so it’s right that more pupils should have the opportunity to benefit from the world class education they provide. It’s also right that access to those places should be fair to pupils from all backgrounds, which is why selective schools must demonstrate how they are going to admit more pupils from disadvantaged backgrounds, if they are going to expand. "It is also a requirement that selective schools work with other schools in their area. Whether through a multi academy trust or an informal partnership, we want to see more selective schools using their expertise to improve opportunities for a wider group of young people." "We are delighted that further selective schools are being given the opportunity to expand. 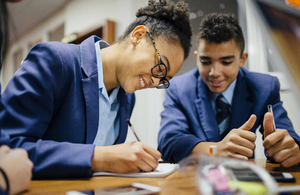 The number of pupils reaching secondary age means that it makes absolute sense that, just like other good and outstanding schools, they are able to expand. "The work we are doing with the Department for Education through our Memorandum of Understanding, is proving most valuable in extending the initiatives that member schools have undertaken in recent years, to increase access for disadvantaged pupils and support other schools in raising standards for all children. Along with the Selective School Expansion Fund, this work is making an important contribution to ensuring more children receive the high quality education that is right for them."